In 1951, under the leadership of Marshal He Long, an auditorium was to be built at Chongqing to accommodate domestic and overseas guests. 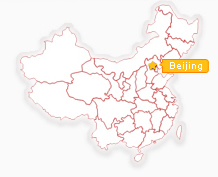 Completed in 1954, it was named into the Chongqing People's Assembly Hall in 1955. After half a century, it still stand prominently at Xuetian Wan, Renmin Road, Chongqing. The hall complex is a cluster of attached structures which contain of the hall and three attached buildings respectively to the east, south and north. Collectively, they cover 66 thousand square meters (about 16.3 acre) of which the hall accounts for 18.5 thousand square meters (about 45.7 acre). The hall is 65 meters high (about 213 feet) and has a capacity of more than 4,000 seats. The hall is in the architectural style of the Ming (1368-1644) and the Qing Dynasties(1616 - 1911). At the first glance, the People's Assembly Hall looks like the Temple of Heaven in Beijing. It is spanned by greenish glazed tile dome supported by scarlet columns. The dome, its parapet railing and brim gleam under the sun. The building's pillars and other structural members are sculpted ornately. The entire assemblage is nestled round gorgeous lush trees complementing the building visual experience. Another way to experience to the hall is to visit it in the early evening when nearby Chongqing People's Square, in front of the hall, is bustling and thriving. The square is a relaxing casual attraction with a musical fountain and evergreen meadow. The hall roof is adorned with multicolor neon lights providing splendid night photo opportunities. 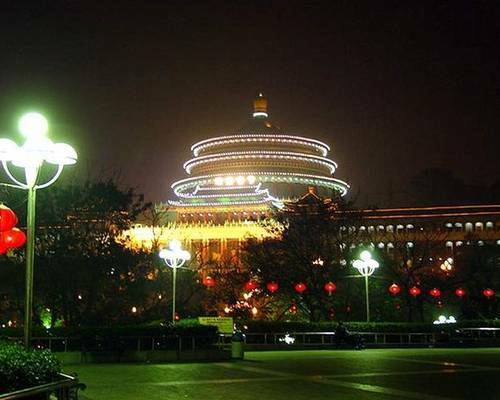 Day or night, People's Assembly Hall of Chongqing will impress you a lot. Such a beautiful scene should be included in your travel plan.